Is there anything more exciting than finally being able to announce a deal that you've spent months working on? We know you're doing lots of deals these days because we get press releases about them every day. But we're just a small team and we simply can't cover all of the amazing deals that are happening out there of every size, every day. We're counting on you to help us out. Now, SponsorPitch members can submit deal announcements to us without having to pay for press release distribution. Just follow these directions to upload a new deal to SponsorPitch's Latest Deals feed on SponsorCrunch. The deal will also appear on your professional profile, as well as our new product, Lead Time™. Once you submit a deal using your membership dashboard, you may also submit a full press release to tips@sponsorpitch.com for consideration at SponsorCrunch, but we ask that you first take a moment to submit the deal announcement following these instructions. It will take your PR team less than 2 minutes to do this. This process creates and sends us a quick summary of the deal, automatically publicizes the deal through the Deal Feed on SponsorCrunch (a picture of which is attached below) and Lead Time™, and generally will allow us to more efficiently process and publicize the news we recieve and report on at SponsorPitch. You can share as much information on the deal as you would like, or simply enter the Brand (i.e. your partner), Property Name (i.e. your organization), Genre (sports, music, etc. ), Date Signed and a Story Link to your press release. It will take a lot less time than typing us out a nice, long email.. : ). Win-win. 1. Sign-up for an account at SponsorPitch. If you don't already have one, it doesn't take long and you can get started here. 2. Sign-in & fill out your professional profile. This is where you can tell the world about who you are, network with other industry pros and chronicle your career accomplishments as they happen. You must sign-in first. The first step is to enter your Contact Info. Once you save that, you'll have the opportunity to add networking interests, brands you've worked with and deals you've done so that you can most effectively network with your sponsorship peers. You'll now have a professional profile, which looks like this. 3. Add a new deal in the Deals I've Done section. If you sold the deal then this will take less than a minute. 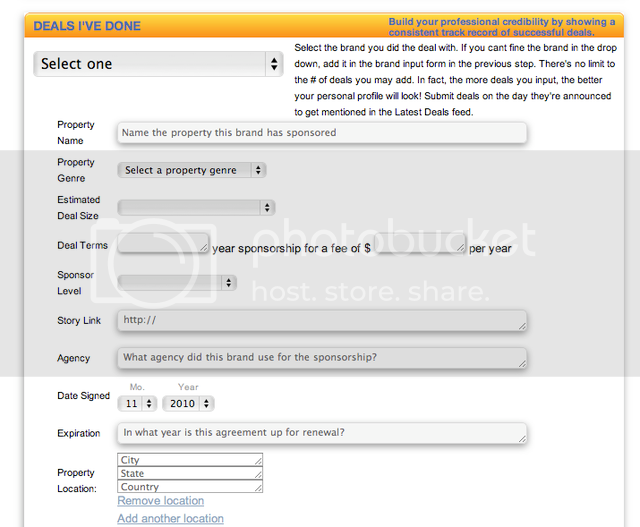 Enter the brand you've done a deal with, all the details of the deal and select the month in which the sponsorship deal was signed as the "Date Signed." 4. Check SponsorCrunch to See Your Deal! Your deal, if it is one of the most recent to be announced, will be displayed on our Latest Deals feed, which you can see an example of below. To appear, it must be one of the 10 most recent deals to be signed and submitted so make sure you add your new deal as soon as it is publicly announced (or before if you can/want). As a bonus, if we find the deal you're announcing as interesting/groundbreaking/unique/etc. we may contact you for quotes and write-up a full article about your newest partner right here on SponsorCrunch, putting you in front of roughly 8,000 of the industry's key decision-makers every month! We're looking forward to hearing your good news!